As of July 6, Sparganothis has accumulated 1,175 DD. Based on the DD model, Sparganothis has passed peak flight, and is laying eggs. 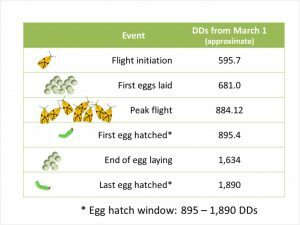 Reminder that a single insecticide application, i.e., post-bloom application with Delegate, Altacor, Diazinon, or Intrepid, aimed at Sparganothis larvae will likely have the greatest effect if it is timed for peak egg-hatch/larval-emergence, which is approximately 1,400 DD and should coincide with early next week. I will keep you updated on these predictions as the season progresses.